Adventure Pilgrims Trekking offers Everest Panorama View Trekking is ideal for all those who wish to enjoy the majestic beauty of the Everest Region but have limited time at hand. 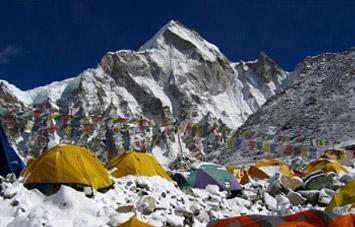 This trek offers spectacular views of Everest, Lhotse, Thamserku, Ama Dablam and many other numerous peaks. Everest View Trek is a moderate trek that also gives you an opportunity to explore the culture and lifestyle of the Sherpas living in the high mountains with out going for Everest Base Camp Trek. It is great to be in this region who are really wants to be on base of mt. Everest. Day 1 : Board an early morning flight from Kathmandu to Lukla (2886m.) which will take about 35 minutes. Trek from Lukla to Phakding (2640 m.) takes approximately three hours. You will start your trek from Lukla following a gentle elevation towards the mountainside on the left bank of the Dudh Koshi River. You will view Mt. Nupla (5885m) atop the Kongde Ridge at a distance from the opposite bank. 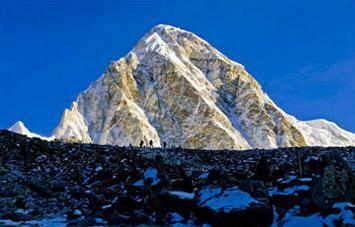 You will then descend a mountainside path that merges with your route towards Everest, watching the magnificent Mt. Kusum Kang (6367m.) Stay overnight at lodge. Day 2 : Trek from Phakding to Namche Bazaar (3440m.) which will take approximately five hours. Day 3 : A rest day at Namche Bazaar (3440m.) for acclimatization. You can have a saunter around the village on this day before heading towards Tyangboche. You can walk up to Khumjung and visit a monastery. You can also enjoy the splendid views of Everest, Ama Dablam, Thamserku, Nuptse, Lhotse, Tawoche, andKwangde. 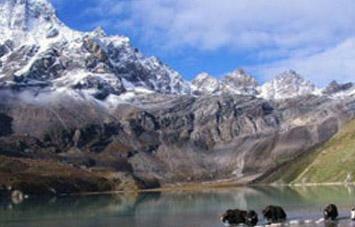 You may also take an hour's walk up to Syangboche (3800m.) where Everest View Hotel is situated above Namche for an outstanding view of Everest, Nuptse, Lhotse, Ama Dablam, Thamserku and Kusum Kangaru. Stay overnight at lodge. Day 4 : Trek from Namche Bazaar to Tyangboche (3867m.) which will take about five hours. Day 5 : Trek from Tyangboche to Shanasha (3670m.) which will take almost two and half hours. You can have a morning visit to the Tyangboche monastery and the nearby museum while in the afternoon you will walk downhill to Phungitenga through the beautiful forest of juniper, rhododendron and fir. After crossing the Dudh Koshi river, you will elevate towards Trashinga from where the trail contours high above the valley to Shanasha where you will spend the night. Stay overnight at lodge. Day 6 : Trek from Shanasha to Monjo (2835m.) will take approximately five and half hours. You can have a quick visit to nearby villages of Khunde and Khumjung which are only at a short distance off the main trail and are worth visiting. Khumjung has a beautiful monastery and Khunde has a small hospital run by the lateSir Edmund Hillary’s Himalayan Trust. Eventually you will return to Namche passing through this route. You will also pass through Everest View Hotel and the Syangboche airstrip before reaching Namche where you take a halt for lunch. After the lunch you will trek downhill and then walk along the river bank back to Jorsale where you will leave the national park before continuing towards Monjo. Stay overnight at lodge. Day 7 : Trek from Monjo to Lukla (2886m.) will take about four hours. You re-trace your steps along the Dudh Koshi, crossing the western bank at Benkar. You will have a leisurely walk watching the blue pine and rhododendron forest, and with views of Kusum Kangaru at the background. Have an early lunch at Phakding and in the afternoon you will incline towards the airstrip in Lukla. You will have a wonderful recreational evening with a farewell dinner and celebratory drinks and dancing with Sherpa companions. Stay overnight at lodge. Day 8 : Fly from Lukla to Kathmandu which will take about 35 minutes. You will board an early morning flight back to Kathmandu enjoying the fantastic views of the mountains if the weather is clear. 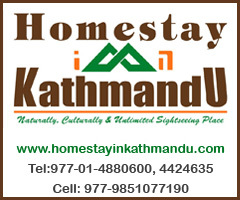 Note: Please let us know your budget and interest for hotel in Kathamndu as well we will arrange city tours and other leisure travel arrangements and other adventures in Nepal, Tibet and Bhutan. Keep some times because bad weather and flight delays in Lukla.